This morning I was inspired by Beth Moore's blog post, Beauty in the Threadbare. She spoke of beauty that is felt not seen. Those things that are beautiful to you because they make you feel something another person may not feel. The simple things. She said, "Simple things tend to have more manners. They won’t say a word if you don’t let them." How many beauty moments have I missed because I've been distracted by the undisciplined busyness and mess calling my name loud? undivided devotion to the Lord. At the risk of too much explaining, I must say I realize this verse is toward the end of the apostle Paul's discourse on the benefits of remaining unmarried in order to better serve the Lord. I am all for being married. However, the principle thing we can pull from this verse is the importance of order in our lives so we can give our "undistracted and undivided devotion to the Lord." dives deeply like a stream into our world-parched souls." Father, open my eyes to Your beauty moments around me. 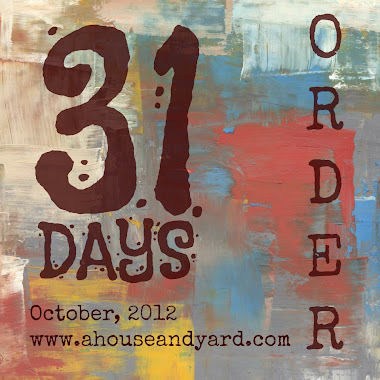 Help me to order my world, inside and out, removing those focus-stealing places of clutter.